I have a really quick and simple card to share with you today using a piece of Laser Cut speciality paper from Stampin’ Up! It was such a quick and simple card to make but the detailed background makes it look like way more work was involved! Stampin’ Up! sell delicately details laser-cut sheets which are Vanilla on one side and White on the other, how clever is that? There are eight 12×12″ sheets in the pack, some of the sheets are a full laser cut piece in 12×12″ which would be perfect for scrapbooking or cutting elements from it. The other piece has borders, lace details and 6 backgrounds or frames for a card front. I used one of the backgrounds for my card. I simply cut around the border and created a card to fit the background. Sticking it in place is a little tricky. I added glue to the border and then a little dot of tombow to the wider elements, such as the block flowers. I stamped the gorgeous greeting from the Needlepoint Nook stamp set (in Early Espresso Ink) and punched it out with the everyday label punch. The ribbon which is threaded through a hole is one of the FREE items during sale-a-bration. 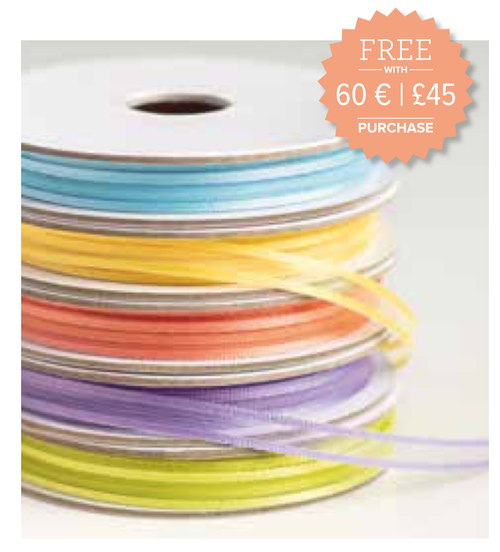 You can choose 23m of ribbon which comes in 5 colours of 4.6m each as your free item if you spend £45 on any goods from the annual or seasonal catalogue till the end of March. Can you see a common theme appearing? Butterflies maybe? I cannot stop using the Botanical Butterfly Designer Series Paper and the coordinating Butterfly Gala bundle. 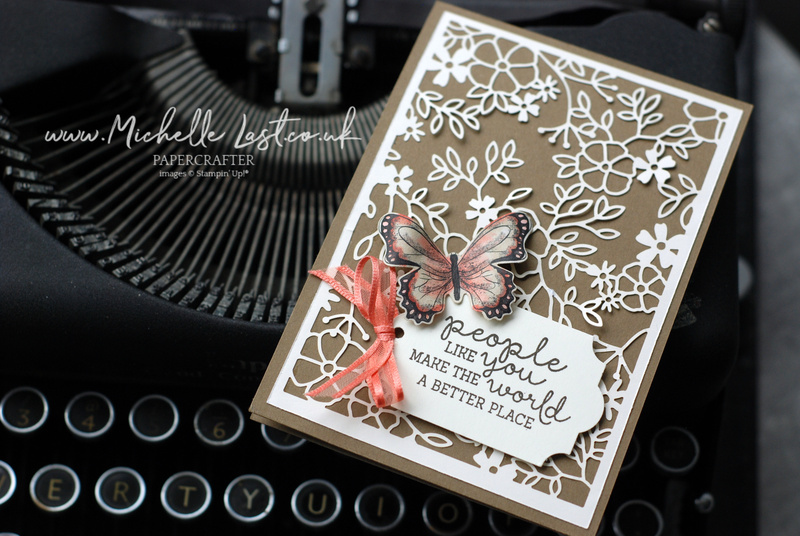 I simply punched out a butterfly shape and coloured with my Stampin’ Blends and added it to the greeting on my card. Why not give it a try and simple send a card Just Because and brighten someone’s day? 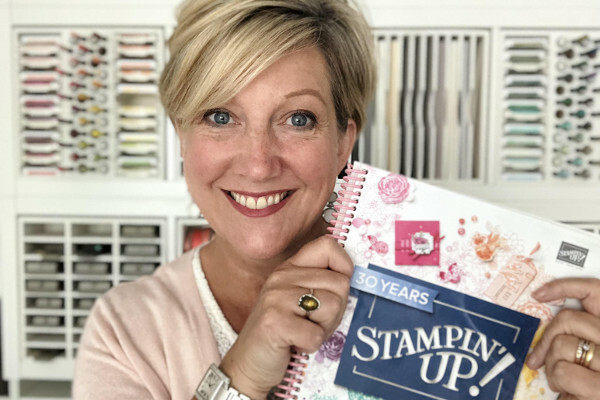 If you would like to place an order for Stampin’ Up! products, click any of the items below to go to that item in my shop. Please add the monthly hostess code to receive a free thank you card/gift when spending £20+ and if you spend £45 on products you can choose a free item from sale-a-bration including the 5 spools of ribbon shown here or the Botanical Butterfly Designer Series Paper. Thanks for stopping by, my card was posted out to someone today, I wonder who will receive it?